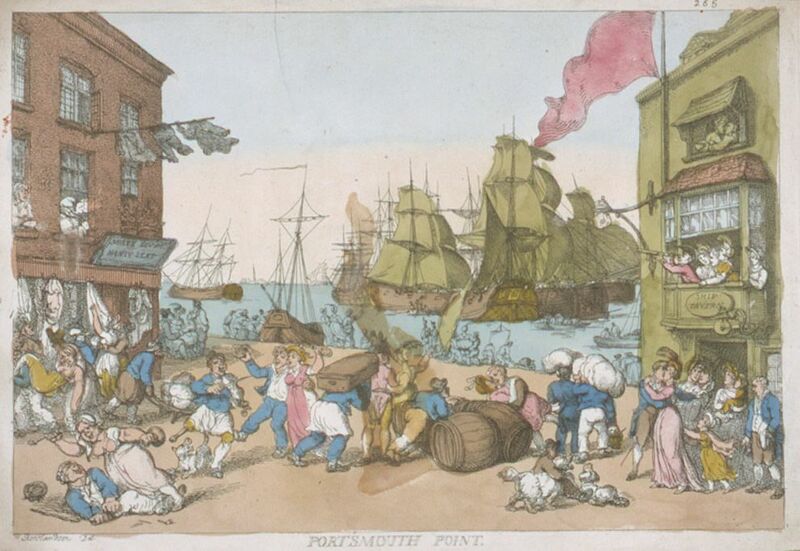 Hand-coloured etching entitled 'Portsmouth Point' created by Thomas Rowlandson and published by Thomas Tegg in 1814. A bustling, rollicking scene on the quay at Portsmouth with sailors just about to embark on two men o'war moored in the harbour. On the left, outside 'Moses Levy Money Lent', sailors pack their belongings and take leave of the local prostitutes, in the centre a one-legged sailor dances a hornpipe, a servant carries an officer's trunk towards the quay and a laughing prostitute pours rum over a recumbent drunken sailor. On the right, outside the 'Ship Tavern' officers kiss their families, a young man kisses a woman against a pile of barrels and an old admiral trains his telescope out of an upper window at the moored ships. Boats ply back and forth in the harbour and young women wave goodbye to their sweethearts on the shore. This Portsmouth Point Art Print is created using state of the art, industry leading Digital printers. The result - a stunning reproduction at an affordable price.